All transactions are safe and secure with a reliable history in online purchasing behind each of our associates. 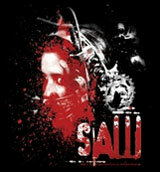 Buy the Saw Movie t-shirt to own Saw clothing and merchandise. The first Saw movie dragged viewers deep into an abandoned bathroom to watch the agony of two men immersed in a killer's game. The shackled pair, played by Leigh Whannell and Cary Elwes, try to outwit their keeper, not knowing he is also in the room. We learn that this is not his first endeavor into rehabilitation. An addict named Amanda has already survived a game. Pair this Saw tee featuring Amanda's bear trap test with the Saw Jigsaw t-shirt. In addition to the Saw Movie tee above, browse the Saw Clothing Gallery for more apparel like men's and women's clothes, kids shirts or hoodies.